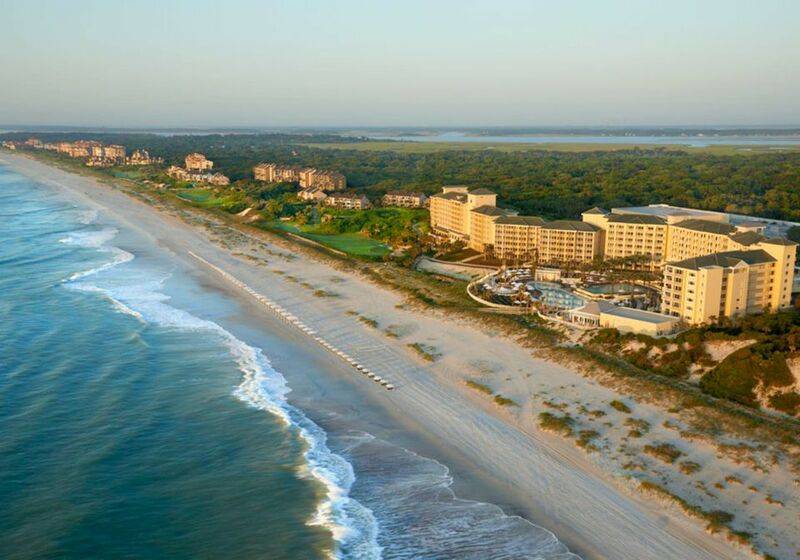 If you're looking for an upscale yet kid-friendly beach resort in northeastern Florida, the Omni Amelia Island Plantation Resort is a terrific choice. Sprawling across 1,350 vast acres on the tip of a beautiful barrier island just off the coast, the resort offers 3.5 miles of pristine beach and so many ways for families to have fun, it would be impossible to do them all in just one visit. The location is drop-dead gorgeous. Named after Princess Amelia, daughter of England’s King George II, and known as the “Isle of Eight Flags,” Amelia Island is the only territory in the United States to have been ruled under eight flags of sovereignty. Once a haven for pirates, rumrunners, nobles and confederates, the picturesque community of Fernandina Beach features an eclectic and charming 50-block area of homes, buildings, galleries, antique shops and quaint eateries on the National Register of Historic Places. While there is a lot to explore on the island, the resort is a mini-community unto itself. Walk through the hotel lobby outside to the largest multi-tiered pool deck in northeast Florida, dotted with palm trees and featuring an adults-only infinity edge pool, 10,000-square-foot family-friendly pool, a water playground for kids, two hot tubs, and oversized fire pits. The poolscape forms the hub of the resort, with a sea of lounge chairs and several restaurants just a few steps away. Beyond the drop-dead-gorgeous beach and pools, the expansive resort begs for exploration. There are are 54 holes of championship golf designed by Pete Dye, Bobby Weed and Tom Fazio; a Cliff Drysdale tennis academy with 23 courts; bike rentals and seven miles of bike trails (Omni Amelia Island Plantation is one of the best Bike-Friendly Resorts to Explore on Two Wheels); fishing at catch-and-release lakes and lagoons; an 18-hole mini golf course; and a gaming lounge with foosball, air hockey, and video games for tweens and teens. Do your kids love animals? One highlight for families is the nature center, which offers hikes and wildlife-oriented tours via kayak (min. age, 8), Segway (min. age, 8), and paddleboard (min. age, 13). A family program offers workshops in crabbing, shark tooth hunting, fishing, and sea turtle discovery, as well as the chance to meet cuddly critters during feeding time. Kids ages 4 to 12 can also attend Camp Amelia, a supervised program that lets children learn about nature, science, salt life, and more in a fun way. (Available weekends, 9am-2pm, $60 per child.) Parents, meanwhile, will want to carve out quality time with a good book or a cocktail on the pool deck or you can choose from a menu of massages at the spa. Hungry? The resort features nine on-site restaurants, including a steakhouse, pizza place, sandwich shop and deli; seafood restaurant; pool cafe; breakfast eatery; pub; burger joint; golf clubhouse; and room service. The Omni Amelia Island Plantation Resort charges a $25-per-room-per-night resort fee, which covers complimentary self-parking; in-room coffee service; local and toll-free phone access; on-property resort transportation service; preferred racquet club and golf course reservations; beach access; free wi-fi; and use of health and fitness center. Best rooms: Each of the resort's 404 guest rooms delivers an ocean view. What's more, each room is spacious, ranging from 425 square feet for a deluxe room to 967 square feet for a one-bedroom corner suite, and featuring a patio or balcony. For the best view, request a room on one of the top floors. The hotel building is enormous, so if you don't want a long walk to your room, ask for one overlooking the pool to be closer to restaurants and other amenities. Best season: Summer is peak season at this Florida beach resort, but also the most crowded. Fall is a wonderful season for a weekend getaway with still-warm water, fewer crowds and lower prices. Always check the resort's special offers for seasonal deals. The Top 10 Most Toddler-Friendly Beach Resorts!